Freedman Benefits Group is unequaled in its ability to offer creative planning that maximizes client benefit. We provide prompt, accurate and professional services to everyone we serve, regardless of the size of the organization or the complexity of the engagement. Our staff treats each relationship with sincere interest, enthusiasm, and a personal commitment to provide superior client service. 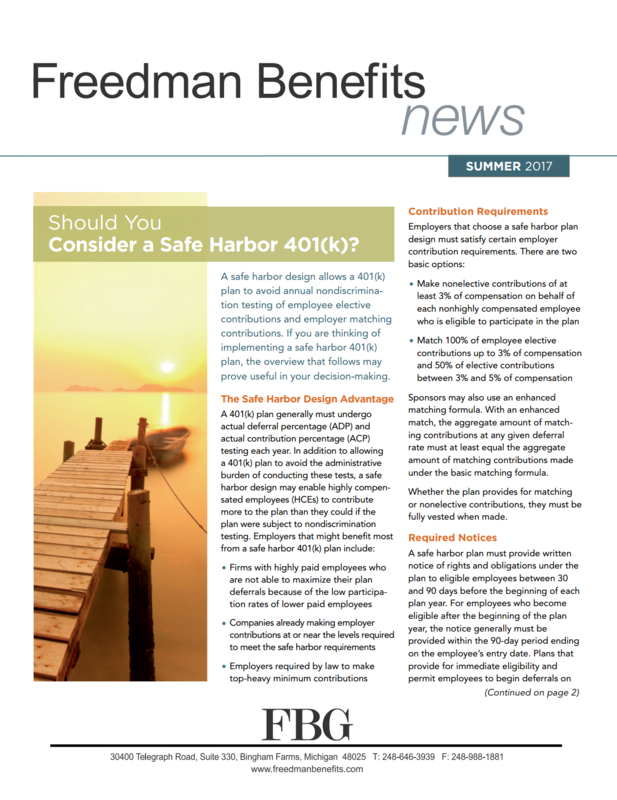 Freedman Benefits Group (FBG) is an innovative employee benefits design and administration firm whose clients are sourced completely through referrals. These referrals come by way of professional advisors and satisfied clients, which creates a unique, wholly self-perpetuating business model. We only gain new business if our current engagements are successful. This process, then, relies on a sterling reputation for creativity, dependability, accuracy and independence. If we don�t provide valuable service to our clients, we simply cease to exist. In other words, success brings success. FBG operates locally, but enjoys a national presence. While we live and work here in Michigan, we also provide pension consultation, design, installation, and administration services across the country. We sit in that hard-to-find sweet spot combining the best elements of a highly responsive, nimble boutique firm, and one that can easily scale up to meet the demands of larger or more complicated engagements. FBG clients range from small businesses, to individuals, to large manufacturers. We represent union-supported corporations and independent employers. We have intimate, local relationships, as well as a clientele beyond our home state. Today, FBG provides administration services for over 200 clients. Seventeen of the twenty-five largest law firms in Southeast Michigan have been our clients or have referred their clients to us. And, a large number of our clients have worked with us for more than 10 years. Regardless of whom we serve, we apply ourselves to maximizing the benefits for each and every unique client situation.